Trade Tested is the number one direct-to-customer importer of sheds in NZ. With quality you can trust, a 12-month rust proof guarantee, and the best prices available, we are your source for sheds in NZ. What makes Trade Tested stand out from the other suppliers and manufacturers of sheds in NZ? 1) All of our garden sheds are long lasting, durable, and manufactured to industry standards. Whether you are looking for a small, convenient garden shed to store landscaping tools, or a large workshop shed, we provide the same sturdy construction and the same quality you can trust. 2) We chose to offer double pressed galvanised steel construction. 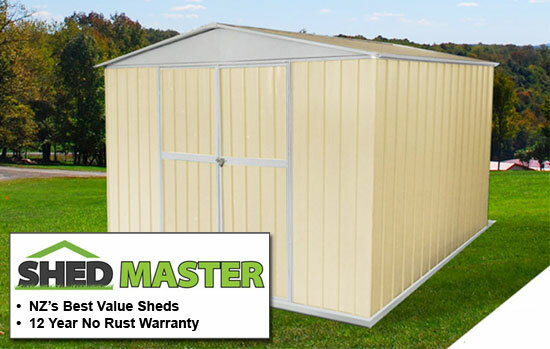 Our garden sheds are all weather resistant, and since they are constructed from steel, you won't have to worry about rotting, termites, or other pests affecting your garden shed. 3) We chose to offer hinged doors on our garden sheds. Hinged doors are safer and more reliable than sliding doors that often stick or become difficult to operate. Our shed doors also come with a lockable for security. 4) With a commitment to excellence, we strive to be the number one, most reliable supplier of garden sheds in NZ. Our quick, reliable shipping, availability of stock, and our knowledgeable customer service department puts you first every time. We're not satisfied until you are satisfied. When you purchase your garden shed from Trade Tested, the sale doesn't end at the checkout. We are committed to you, our customer, every step of the way. Whether you have questions about your shipment or need a few pointers during the assembly process, we are here for you. Trade Tested is your Source for Sheds in NZ!